Hellfire Electronic Drum Systems - MARK Drum & 2Box eDrum kits at US stores! Home eDrum News MARK Drum & 2Box eDrum kits at US stores! 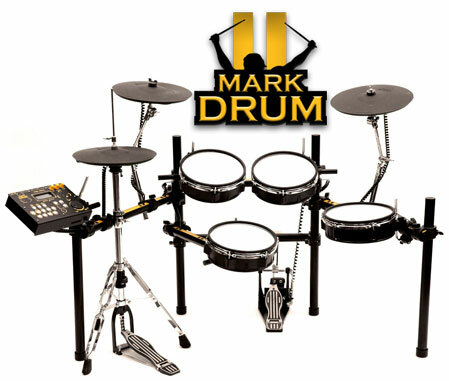 Pictured above is one of the new electronic drum kits on the market in the US and it’s the Mark Drum (2Box Drumit5 being the other see: 2BOX DRUMIT 5 MK2). The MARK Drum edrum kit was first shown in the states at Winter NAMM 2012 and got quite a bit of interest by the people at the show. Up until now there has only been Roland, Hart Dynamics, and Pintech that offered a mesh head based electronic drum kits here in the states. Out of those three, only Roland produces their own drum modules. Now with 2Box Drumit5 and MARK Drum, edrummers in the states have two more choices when it comes to playing mesh head electronic drums and not only that, but 2Box and MARK Drum make their own drum modules as well. So if you are wanting to get your hands on one of these drum kits in the U.S.A., where do you go? As of the writing of this blog post MARK Drum edrum kits can be bought at Guitar Center. They are not currently listed on Guitar Centers website, but it is available at some Guitar Center store location. You can see the ad placement from Guitar Center with MARK Drum kit in it here: Guitar Center Ad. 2Box has been available over seas for the last couple of years, but now if you live in the states you can buy it here as well. Using Old or Discontinued Modules As TMI’s? Yamaha’s DTXTREME III is Coming!! !